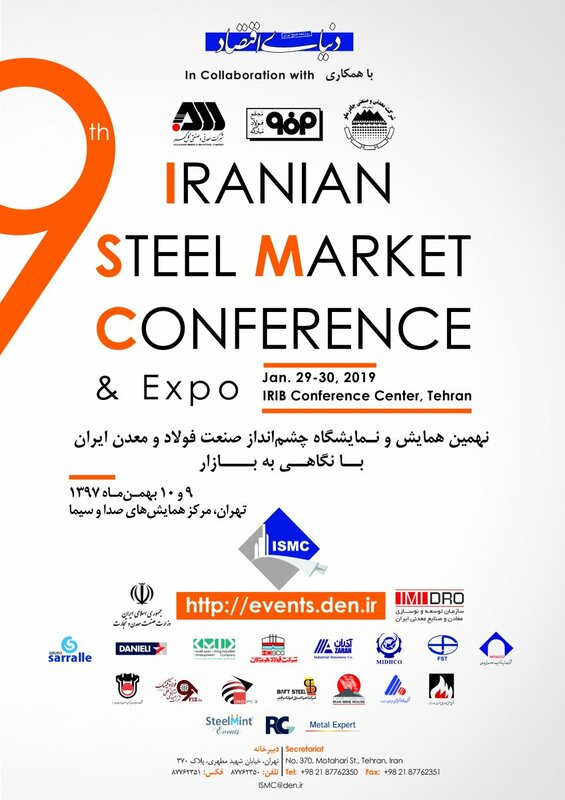 EghtesadOnline: The ninth edition of the annual "Iranian Steel Market Conference", also known as ISMC 2019, opens today at the Islamic Republic of Iran Broadcasting’s International Conference Center. The two-day event has been organized by Donya-e-Eqtesad Media Group, the parent company of Financial Tribune. Steel and mining industry veterans get together on the occasion to discuss challenges and opportunities ahead. Keynote speakers addressing the event include Industries Minister Reza Rahmani, his deputy for mining affairs, Jafar Sarqeyni, CEO of Iran's biggest steelmaker Mobarakeh Steel Company, Hamidreza Azimian, and Donya-e-Eqtesad Media Group's CEO Alireza Bakhtiari, according to Financial Tribune. Notable foreign guests who will also address the conference include Joachin Schroder, CEO of Research Consulting Group, Dennis Matos from Sarralle Group, and Oksana Golovko, a representative of Metal Export. A specialized forum has been scheduled for the evening to survey the current state and outlook of Iran's steel industry, as the country has come under stringent US sanctions. UK-based analysts in Fastmarkets say the new round of US sanctions against Iran are expected to cut Iranian steel exports, which will gradually lower steel output. Trump announced his decision to pull out of the nuclear deals Iran signed with world powers, including the United States, in May.